New numbers support speculation that the shrinking print advertising industry will fall behind its fast-rising digital counterpart. It looks like this is the year that Internet advertising revenue finally surpasses ad revenue in print media. In the first half of the year, U.S. Internet sites collected $17 billion in ad revenue, a 14 percent increase over the same period of 2011, according to a new report from the Interactive Advertising Bureau. In the second half of last year, websites had $16.8 billion in ad revenue. So even if growth were to slow in the second half, digital media this year could exceed the $35.8 billion that U.S. print magazines and newspapers garnered in ad revenue in 2011. In fact, the digital marketing research firm eMarketer projects 2012 Internet ad spending in excess of $37 billion, while print advertising spending is projected to fall to $34.3 billion. 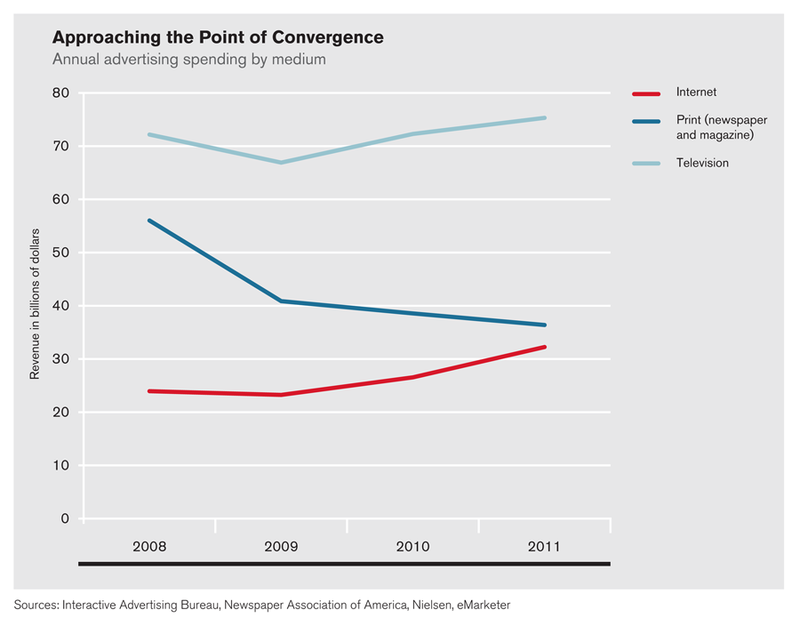 Meanwhile, television ad spending—which Nielsen reports was nearly $75 billion in 2011—continues to dwarf both.